When one goes to see films like Solomon Kane, The Kingdom of Heaven or Eragon, one invariably goes with low expectations: the lower the expectations, the less chance of disappointment (even if you enjoy the genre). 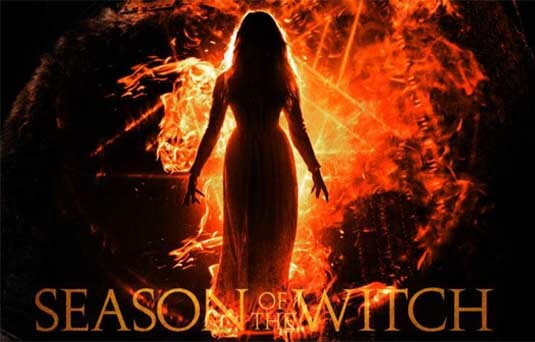 Season of the Witch very much comes into this bracket of poor films wherein one has to aim low in order for it to be remotely worth watching. 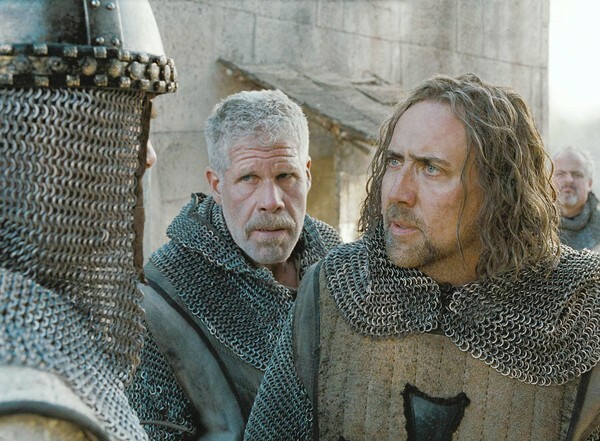 Felson (Ron Perlman) and Behmen (Nicholas Cage) as knights of the Church telling a fellow crusader of their intention to quit the fight against the Muslims. The movie is set between the thirteenth and fourteenth centuries in Europe, during the time of the Crusades. Behmen (Nicolas Cage – Face/Off, Con Air, Joe) and Felson (Ron Perlman – Hellboy I & II, Conan The Barbarian) are knights fighting for Christ and God against the Muslims until they become disillusioned with the Church. Subsequently, they desert and go back to Austria. But on their return, they find the towns and villages ravaged by bubonic plague. It is said that a witch (Claire Foy – Little Dorrit) has brought this affliction upon the land; for wherever she goes, so does the contagious disease. It is decided by the local cleric that the witch must be taken to another town to be tried by the most learned priests in the country. The cleric believes that by charging her with witchcraft, God will end the plague. Thus, it is up to Behmen and Felson to take her to this town. A handful of others join them. But the road is dangerous and few have ever ridden it. (Fewer still have returned to tell the tale.) And with the witch travelling with them, unforeseen problems will arise. The plot is probably a little more entertaining than that. But whether the storyline is the basis for the film’s entertainment is doubtful. The special effects (if one can call them that) throughout Season of the Witch are appalling. Likewise is the acting and the dialogue. Arguably, the thick American accents of Nicolas Cage and Ron Perlman, despite being in medieval Europe, epitomise the pathetic and comic nature of the film’s production. Despite these, there are aspects of Season of the Witch that give the film amateurish respectability. The sarcastic humour/banter between Behmen and Felson makes for some amusement; especially, when their wry remarks are aimed at the corruption of the Church. Similarly, the witch’s devilish smile keeps one guessing whether she is actually a witch or a mere victim of a medieval witch-hunt. 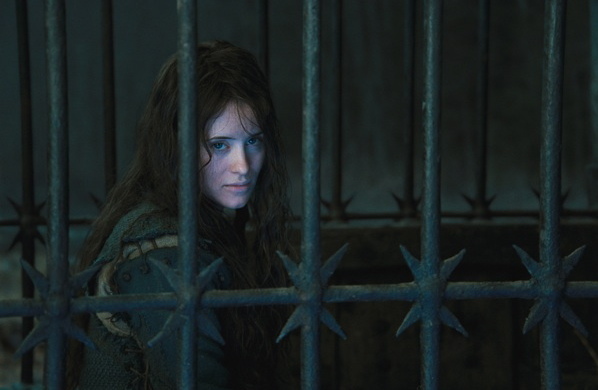 The witch (Claire Foy) is caged up as she is transported to her trial. There are few who doubt that she’s not guilty of spreading the epidemic to wherever she turns up. The historical features of the film are also quite accurate. Whilst Behmen and Felson are undoubtedly fictional characters, the battles they fought in are not. Additionally, the director, Dominic Sena (Gone in Sixty Seconds, Swordfish), has shown medieval villages and towns for what they really were: crap-holes. Very often, Hollywood glosses over these details by making towns and villages appear relatively clean, and by making the inhabitants of such places look happy. In Season of the Witch, there is none of this. Sewage, smoke, rubbish, mud, dirt, rats, plague and misery are part of everyday life for the folks here (just like it was for our ancestors) and are well detailed. Indeed, after seeing some of these scenes, one can understand why the Black Death used to spread like wildfire until hygiene became the general consensus. Over-all, one can put together a long list of reasons for why not to see Season of the Witch. The film has very little saving grace. For those who don’t like the genre, one may struggle to justify finishing the movie. For those who do enjoy the genre, one is left to laugh at how poorly it has been produced. However, that and very low expectations are what saves Season of the Witch from total disaster. This entry was posted in Ancient & Historical, Fantasy and tagged conan the barbarian, crusades, fantasy, film, historical, medieval england, nicholas cage, review, reviews, ron perlman, season of the witch. Bookmark the permalink. It’s tight to see a specialist into whom you can be a number put your trust in. Internationally in today’s time, nearly literally loves demonstrating to many more the answer in this particular subjecttopic. The way in which fortuitous I’m now to acquire obviously established quite a awesome web site because this. It’s people like you who actually prepare a substantial big difference currently using the procedures you examine. Thanks for taking the time to compose this! My brother suggested I would possibly like this website. He used to be totally right. This publish truly made my day. You cann’t imagine just how a lot time I had spent for this info! Thanks! Usually I do not write-up on blogs, but I would like to say that this article quite forced me to do so! Thanks, quite nice article. Some good insights into the witch’s ambiguous smirk. I didn’t cover that I’m my review. We seem to have visited the same topics in our rants about how poor this film is! Lol. I may see the movie just to hear Nick Cage’s bad English accent! also that’s interesting point about the settings and surroundings being detailed and portrayed well. It’s always great to see a setting that looks genuine, Great Review! !